A few days after the trick or treatin’ and I am still on my bed. Well this is my special day but I couldn’t get myself up to start it because of this weak feeling of bad flu and colds for days. Unfortunately, the plans I made will be spent with my comfy bed and a couple of tissue for the rest of the day. What else can I do, aside from lying in bed and occasionally get up to go to the bathroom, but to allow my mind to wander on places I wish to go and to reminisce the places I have been in the past. Last year was a little more interesting. 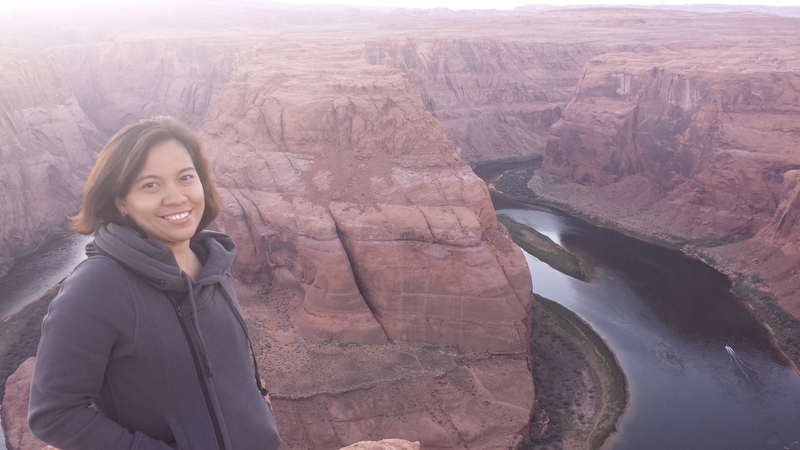 I had to celebrate my birthday at the highest view of the Horseshoe Bend (on a sunset) and at the lowest point of the Antelope Canyon both at Page, Arizona without anyone knowing that their trekking buddy (me!) is changing age as of the moment — just like a snake changing skin every now and then.. haha! It was such a wonderful feeling of nostalgia when I stood at a certain point. A feeling of longing for the lost past and a feeling of excitement for what the future may bring to my life. I wished for that moment, to find solitude in nature, to just simply breath the fresh air while my eyes are closed as if trying to force the time to stop and take a picture of the perfect moment. Can’t believe that it has been a swift 12 months already, it feels as if I am still living on my grandest vacay ever! And yes.. it is only a sweet long vacation and that the time will come I will have to get back to reality where perfection is unknown and change is consistent. Moments like this in the past may have only occupied quite a small space in my jar, but the feelings it brought into my life are the ones that shaped my perception about life itself. The feelings of balance and serenity, humbleness and simplicity. I have been roaming half the world since my late twenties experiencing the clear waters of the country’s treasured provinces or visiting the mysterious leaning tower in Pisa or giving my respect to the Vatican, Catholics consider as holy ground. I must say, some are overrated while others are obviously not. I find peace in places where few people know about and where ladies restrooms are not crowded by weary tourists. As last year was more interesting than the previous, I wish to go places; doesn’t matter if I have been there before, as long as the journey takes me to an interesting ride. I have for the past year (and soon two years) been living in the world as a thirty something woman. There has been a lot of ups and downs. A series of adventures and boredom. A mouthful of hopes and giving ups. It is indeed an unpredictable life. I thought that when I turn thirty I will be wiser. Well, smarter than when I was in my twenties. So I can’t wait for my birthday to come when I was twenty-nine. But it seems as if the more I get into a new phase, the more complicated things get. The more you know things, the more you get confused. I thought I would be more in control but the things around me does get me back to reality. The more things come up, the more you learn to change what was originally planned. I thought that being thirty would mean that you have more right in the world to experience loss, heartbreaks and mourning but instead you realize when you wake up that you have a lot lesser time to accomplish your goals in life. It would mean lesser time for you to get up and fix yourself. Lesser time to be “successful”. As time continue to tick, you wish that the clock would stop for once but unfortunately you end up tired of running after the lost time. You didn’t notice that you have moved on again to another phase. I thought it would become easier because in your thirties people will not think of you as a young indecisive individual. You have already gained the badge of being a credible thinker. A reliable decision-maker. You might also moved up a notch in your finances, believing that the world is now on your side, opportunities keep crawling on you but you realize later on money is not everything. I realized that you can’t figure out everything all at once. You just have to be true to yourself and accept that you still have a lot to learn. There are people, even in their forties, who have totally no idea of what they want in their life. They act as if they know everything and prove to everyone that they are always right, bluff about how they managed to ‘get out of this’ or ‘survive that’ but truth is, they are also as confused and scared with life as everyone else. I keep them close, the people who managed to live until the dawn of their life, who share stories about their humble beginnings. I admire them, as I know their words will become my treasure one day. The people who admit that they made many mistakes, that they learned from it and that they do not know everything yet. On the other hand, I take notice of others who might need my advice as I see myself in them. I realized that age is only a number. There are people younger than me who experienced overwhelming tragedies a lot sooner in life. Lost several family members or was forced to live alone. They are more admirable because at their young age, they survived. They did not grow bitter, they still smile. They still believe in the power of God. Their heads are always held up high while keeping their feet on the ground. The good part is that they realize early in life what the most important things are, neither money nor fame but all other immaterial things such as faith, compassion and love.